Thanksgiving Turkey Leftovers – Try this famous TURKEY TETRAZZINI recipe! This dish purportedly was named for Luisa Tetrazzini, an Italian soprano who was popular in America in the early 1900’s. Beautifully plump, she supposedly once said, “I must not diet. If I diet my face sag”. She loved rich pasta with chicken or turkey and mushrooms and this dish was created for her by an unknown chef. All kinds of variations exist including adding peas, toasted slivered almonds and more. 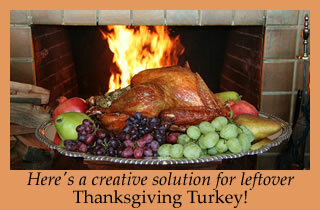 This is a wonderful dish to make with leftover Thanksgiving turkey. This is from my James Beard Award winning Book “Culinary Birds”. Just in time . . . no?!! Sauté the mushrooms in 2 tablespoons of the butter in a heavy 4 quart saucepan until lightly browned and all liquid has evaporated. Set pan and mushrooms aside. Melt 3 tablespoons butter in a small sauce pan over moderate heat. Add flour and cook, stirring, for 2 to 3 minutes to make a roux. Gradually whisk in the broth, cream and sherry. Bring sauce to a boil and then reduce heat to a simmer and cook for 5 minutes, whisking the whole time. Stir in the nutmeg and season to taste with salt and pepper. Meanwhile cook the pasta in boiling salted water until al dente. Drain well. Stir half the sauce into the turkey and the other half into the mushrooms along with the pasta. Transfer mixture to a buttered 8 cup baking dish or casserole and make a well in the center. Spoon turkey mixture into the well. Combine the parmesan with the bread crumbs and sprinkle evenly over the top along with the remaining tablespoon of butter cut into small bits. Bake in a preheated 375 degree oven for 30 minutes or so or until bubbling and top is lightly golden brown.